What have we been up to since 2016? All kinds of fun stuff. The Coyote Fund was established as way to support students in their research efforts, including senior studies. There is no formal application to apply, but any student interested in requesting funding is required to submit a proposal to the review committee. The committee consists of three faculty members: Dr. Traci Haydu, Chair, Division of Education, and Associate Professor of Exercise Science at Maryville College; Dr. Mark O’Gorman, Professor of Political Science and Coordinator of the Environmental Studies Program at Maryville College; Dr. Ariane Schratter, Associate Professor of Psychology at Maryville College. The committee reviews applications and determines which students will receive funding of up to $500. Mountain Challenge receives information about the work once the research is completed, which can be in the form of a copy of their senior study, a poster, or a summary of their research and findings. Read about some examples here. For those looking to enhance their outdoor workouts, we teamed up with the college’s intramural program to purchase a fit station. A fit station is ideal for building core, chest, arm, and back strength using bodyweight exercises such as push-ups, dips, leg raises and more. Two of these were purchased through the Alumni Association. One is being used on elsewhere on campus, while the other will remain at Camp 4. The Peer Mentors student organization was given $500 to further promote Fit. Green. Happy among students. They will be offering various activities throughout the school year. 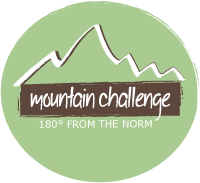 We sincerely appreciate your support of Mountain Challenge and our students. All money raised through the Alumni Association will go toward student experiences and activities. Thus, the more money we raise, the more opportunities our students, and future leaders, will have to change our world for the better.